What's not to love in this beautiful, spacious 5 bedroom/3 bathroom, corner lot home with 3,192 finished sq ft of generous space. Upon entry you are greeted by hardwood floors and an amazing open concept living/dining room. The large kitchen maximizes functionality w/ plentiful cabinets, new granite counter tops including a kitchen island, professionally installed back splash, huge walk-in pantry & eat-in areas (all kitchen appliances included). An adjoining family room easily accommodates a colossal sectional. Conveniently upstairs you'll find a bonus loft, laundry room, 4 beds, 2 full baths & includes enormous master retreat. A private office or non-conforming 5th bedroom is tucked away on the main floor. You will enjoy a very private back yard with only one neighbor to the North. The covered back patio makes for a lovely back yard get away! 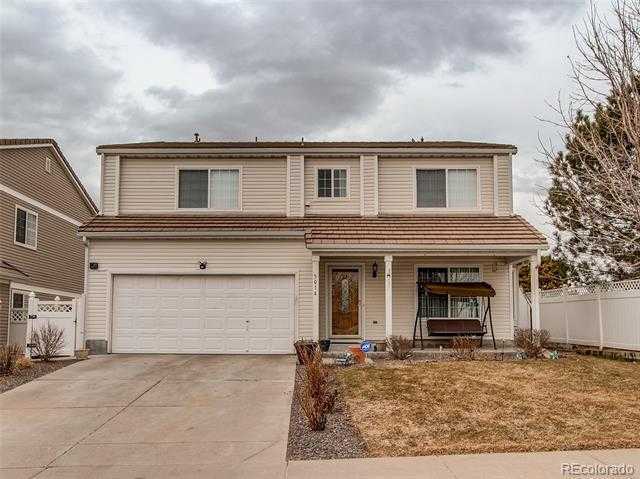 2 blocks to the elementary school and easy access to I70. E470, DIA, and a light rail station.